Here is the latest update on the status of the multi-district litigation involving the 3M™ Bair Hugger™ warming system. One case went to trial and 3M won. Nine have been withdrawn by plaintiffs before ever reaching trial. One was dismissed by a federal district court. Another was dismissed by a Minnesota state court. One was deselected and returned to the broader pool of cases. Some background: In multi-district litigation involving a large number of lawsuits, courts try “bellwether’’ cases, which are nominated by plaintiffs and defendants and supposed to be representative of the entire pool of lawsuits. The idea is that courts will hold trials of the bellwether cases and the outcomes of those trials will help determine the fate of the larger pool of lawsuits. 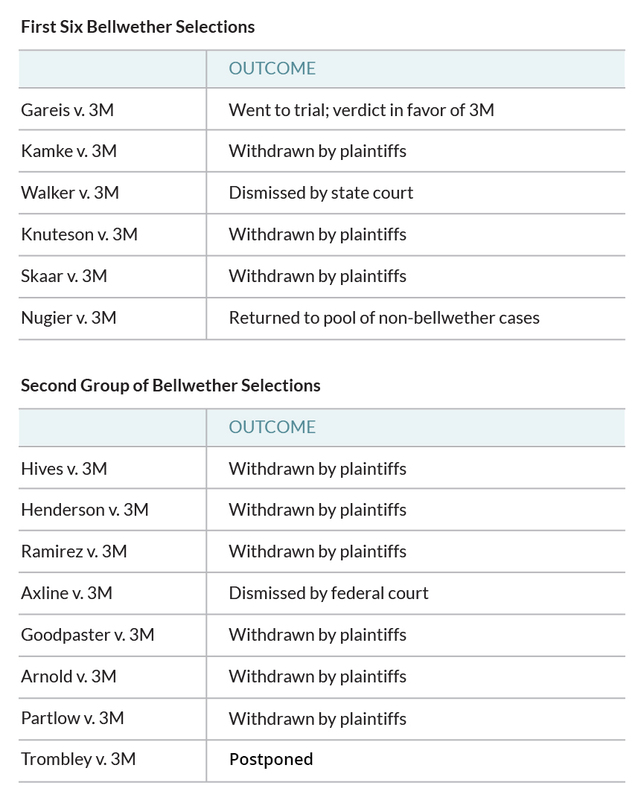 To date, 14 lawsuits have been selected as bellwether cases. Of those, only one trial has occurred, one case was dismissed by a federal district court, one case was dismissed by a Minnesota state court, another case has been postponed, and ten cases either have been withdrawn or pulled from the pool. Meanwhile, more than 590 lawsuits in the larger pool of cases have been dismissed, either by plaintiffs or by court order. Bottom line: Five years into the litigation involving the Bair Hugger warming system, 3M has not lost a single case. Nor does it expect to. Every one of the lawsuits is based on bad science orchestrated by a 3M competitor with a track record of misrepresenting facts and an actual conviction for fraud. There is no proof the Bair Hugger system causes infections. In fact, in August 2017, the U.S. Food and Drug Administration recommended that healthcare providers continue using warming devices, including forced-air devices such as the Bair Hugger system, for surgery when clinically warranted. Fortunately, most medical providers have taken the time to understand the facts and thousands of patients each day are continuing to be warmed with the Bair Hugger system. The case dismissals are not entirely surprising. In a 2015 paper, attorneys from law firm Skadden, Arps, Slate, Meagher & Flom noted that multi-district litigations tend to become magnets for lawsuits. As the bellwether record shows, the plaintiffs’ cases in this litigation have not survived scrutiny.